As always, a larger image can be found by clicking on the above. 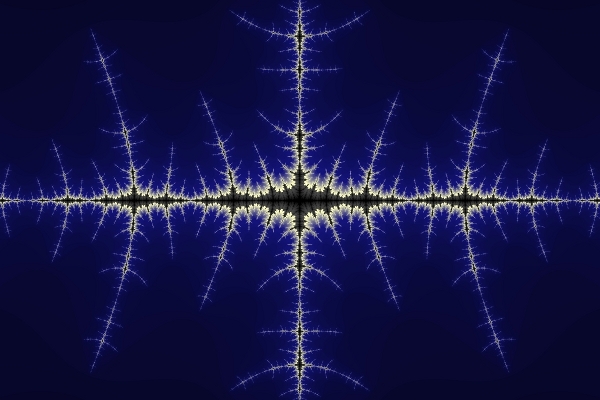 The original is about 2.4 MB, and shows a larger region of the pictured fractal. 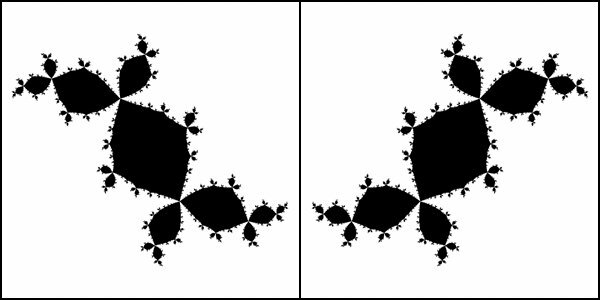 Both of the above Julia sets were generated with nearly the same constant, except that the imaginary component of the one on the right is positive, and the imaginary component of the one on the left is negative. That is, the constants used to generate those reflected images are complex conjugates. However, if we generate a Julia set using a real number (i.e. a number without an imaginary component), the image will be not only rotationally symmetrical, but also have reflective symmetry. This is the kind of symmetry that most elementary school students are introduced to—the images could be cut in half, and the two halves would match up. Julia sets with real constants are symmetrical both horizontally and vertically, which is an interesting property for a figure to have. The image at the top was generated using the constant \(-1.4012\). The towers of a fractal city rise into the night, and are reflected in the lake below.